Two white farmers who forced a black man into a coffin and threatened to pour in petrol and burn him alive, have been jailed for 25 years. Theo Jackson and Willem Oosthuizen were convicted of attempted murder, assault and kidnapping, during the trial. 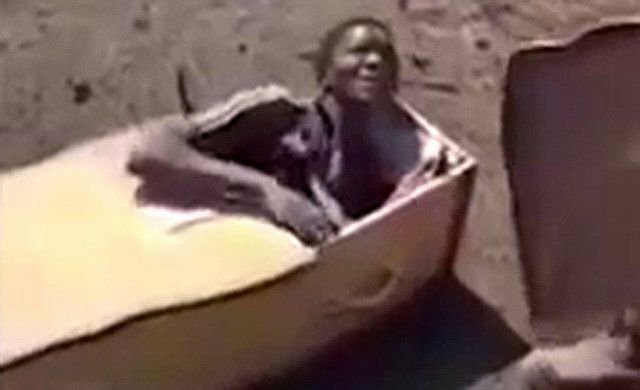 The 20-second video, widely circulated on social media last year, shows the victim, Victor Mlotshwa, cowering inside a coffin as one man pushes the lid down and the other threatens to put fuel and a snake inside. Jackson was sentenced to 14 years, and Oosthuizen 11 years, after both pleaded not guilty. They said they had caught Mlotshwa trespassing on their farm in possession of stolen copper cables. The case, heard at a court in Middelburg, about 100 miles east of the capital, Pretoria, has caused outrage in a country where deep racial divides persist 23 years after the end of apartheid. When she handed down the sentences, Judge Segopotje Mphahlele said she was appalled that the accused had put Mlotshwa into a coffin. She said: ‘The evidence before court indicates that the seriousness of the offence far outweighs the mitigating factors and the personal factors of the offenders. ‘The conduct of the accused fuelled social division and racial tension.’ The defence immediately requested that it be allowed to appeal the sentence, but Mphahlele dismissed their application. The defence then said it would lodge their appeal directly to the Supreme Court of Appeal, saying that the sentence was too harsh, since no one had been killed. South Africa’s Justice Minister Michael Masutha said the sentence could serve as a deterrent to others. He said: ‘South Africa is no longer prepared to treat racism with kid gloves and we are ready to act.’ A large crowd formed outside the packed courtroom. The police presence around the court was heavy. ‘What they did was painful to us,’ Qgoga Mnyamezeli said outside the court. 0 Response to "White farmers who forced black man into a coffin jailed for 25 years "